Question - Changing Front Camshaft Seal? I have a 1998 Camry with the 3.0L V6 (1MZ-FE I think). It's hard for me to write this, but this Camry has been one of the worst vehicles I've ever owned. It's hard because the vehicle it replaced, an '88 Camry, was easily the best vehicle I ever owned. With all that, I recently had the timing belt and water pump done on the '98. Immediately after getting the car back, I found a pretty good oil leak coming from about where the front camshaft is located. I haven't pulled the plastic timing belt cover yet, but I don't think there's anything in that same area that could be the source of an oil leak. My question is that if it is the camshaft seal, can I replace it without essentially doing about 3/4 of a timing belt job? I ask because it looks like I would have to go through the process of removing the timing belt so I can remove the camshaft pulley to change the seal. 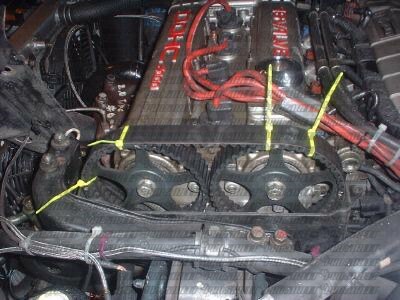 Or can I just loosen the timing belt tensioner enough to get enough slack in the belt so that I can remove the camshaft pulley and replace the seal. Any help/suggestions would be greatly appreciated. Last edited by dirty hands; 11-17-2016 at 04:31 AM. Thanks for the link, that's an excellent manual. If I line up the timing marks, can I then just loosen the cam shaft pulley bolt and remove the pulley to change the seal without taking the belt off the crank shaft? Last edited by dirty hands; 11-17-2016 at 05:57 PM. Thanks again. The picture is a big help. I'm gonna try to do it this weekend. Quick Reply: Question - Changing Front Camshaft Seal?